Be the first to share your favorite memory, photo or story of Dolores. This memorial page is dedicated for family, friends and future generations to celebrate the life of their loved one. 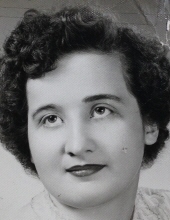 Dolores Jean Fairman, 82, of Vandergrift went to be with the Lord November 28, 2018. She was born on December 2, 1935 and the daughter of the late Walter (Mary McHenry) Baum. Dolores is a graduate of Vandergrift High School, class of 1955 and a member of The First Baptist Church of Apollo. She was once employed at the Jean Factory and as a Vandergrift Telephone Operator. Dolores enjoyed watching her soap operas and pro wrestling, collecting angel figurines, and reading her bible. She is survived by two sons; Scott (Shawn) Fairman of Apollo and Bud Fairman of Harwick, four daughters; Cheryl (James) Kettering of Ford City, Jodi (Kevin) Cline of Avonmore, Kim (Robert) Fanelli of Ford City, and Linda Baxter, thirteen grandchildren; and nine greatgrandchildren. In addition to her parents she is preceded in death by her husband Wylie Fairman Sr., a daughter Robin Cumberledge; a daughter in-law Terri Fairman, and two brothers; Wilson and Robert Baum. Family and Friends will be received on Friday, November 30, 2018 from 12:00 pm to 2:00 pm and 5:00 pm to 7:00 pm with a service at 7:00 pm at the First Baptist Church 106 Owens View Ave, Apollo, PA 15613 with Pastor Ira Schaffer officiating. Arrangements entrusted to The Janette L. Gamble Funeral Home Inc. (724) 567-7006. Online condolences may be made at Gamblefh.com. To send flowers or a remembrance gift to the family of Dolores Jean Fairman, please visit our Tribute Store. Family and Friends will be received for a visitation on Friday, November 30, 2018 from 12:00 pm to 2:00 pm at the First Baptist Church 106 Owens View Ave, Apollo, PA 15613. Family and Friends will be received for a visitation on Friday, November 30, 2018 from 5:00 pm to 7:00 pm at the First Baptist Church 106 Owens View Ave, Apollo, PA 15613. Family and Friends will be received for a Service on Friday, November 30, 2018 at 7:00 pm at the Apollo Baptist Church 106 Owens View Ave, Apollo, PA 15613 with Pastor Ira Schaffer officiating. "Email Address" would like to share the life celebration of Dolores Jean Fairman. Click on the "link" to go to share a favorite memory or leave a condolence message for the family.